Congratulations to the winners of the June competition. The winners have received their Matchless Rechargeable E-Cigarette which we hope you’ll enjoy vaping with! Keep an eye on more competitions on our Facebook, Google+ and twitter pages. If you’re not already following us on these, you should, as you’ll have access to all the latest site and service news, new products and offers, informative blog articles as well as exciting competitions. Matchless is now on Google Plus and we’d like to invite you to join us and take part in competitions, giveaways and all the latest news ranging from company news at Matchless to all the latest news and media bits related to ecigs and vaping. Join Matchless on Google Plus! To kick off our Matchless Google Plus page we’re giving away 100 FREE Matchless Rechargeable Ecig kits. These come complete with a USB Charger and two liquid cartridges, so it’s ready to vape for the winners of this great prize. To enter the Matchless competition all you have to do is follow our Google Plus page and +1 the post about this competition! At Matchless we’re excited about the launch of our Google Plus page and looking forward to sharing more content from around the web related to vaping with you, as well as fun competitions and giveaways. To follow us: simply log into your Google Plus account and follow the Matchless ECig page. To enter the Matchless competition don’t forget to +1 the post on our google plus page which mentions this competition! If you don’t have a Google Plus account, then our giveaway is a great reason to get one. Simply go to the google plus homepage (http:// plus.google.com) signing in with your Gmail account details. Once signed in look for the box or option to upgrade your account and Google will walk you through the rest. Win a Matchless Rechargeable ECig with two cartridges and a USB Charger! 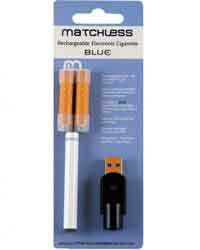 Throughout June you have the chance to win a Matchless rechargeable ecig kit. Simply follow our Google Plus page and +1 the post which talks about the matchless competition. We’ve pinned the post for you at the top of the Matchless Google Page so it’s easy to find! The Matchless Google Plus competition participants must be 18 or over and must be the owner of a genuine email address and Google Plus account. Matchless Competition entrants must follow the Matchless ECig Google Plus page and +1 the post related to this competition. The competition will close on 30th June 2015 and winners will be chosen by random by an authorised member of the Matchless team. Winners will be notified by email or directly through Google Plus. Vaping is not proven to be healthy however they’re not as harmful or dangerous as tobacco reports The Guardian on 23rd February 2015. A report by Linda Bauld , Professor of Health Policy at the University of Stirling and Deputy Director of the UK Centre for Tobacco and Alcohol Studies, was published by The Guardian on vaping. Smoking tobacco will shorten lives by on average 10 years, further, secondary smoke particles exhaled contain tar particles and some toxic gases that can affect those in the near vacinity. It has been acknowledged by the National Institute for Health and Clinical Excellence and the Medicines Healthcare Regulatory Association that e-cigarettes are safer than continued tobacco smoking. This is a fact and one that is supported by tobacco control organisations in the UK. To state otherwise is false. Liquid nicotine comes from the same tobacco leaf and the main danger today is if the packaging is not child safe. However let us not forget that there are many poisons in our everyday household products. The Guardian on vaping continued with some interesting fact from US: there were 2.6 million calls to poison control centres in 2013 and 0.06% of these related to nicotine products including e-liquids. We do agree that these e-liquids need to be safely packaged and clearly labelled, and users need to keep these products away from children. Should it be banned in public places? One fact to consider here is that vaping vapour is not the same as second hand smoke. It is not smoke, it is vapour and there is no good evidence that exposure is harmful to bystanders (particularly outside, as in NHS grounds). Let us not state otherwise. We believe it is not long before an electronic cigarette (or equivalent) will be licensed as a cessation device- then such public bans will be unworkable. What we don’t want now is to discourage smokers from trying a device that could stop them from smoking….reports The Guardian on vaping in their February 23rd article. Very interesting and well written piece of news for our industry from the Spectator on vaping. The Spectator debates the challenges faced by e-cigs, vaping and other innovative ways of delivering nicotine without the dangers of burning tobacco. Some interesting statistics also reveal how the popular Swedish ‘snus’ which provides an alternative to burning tobacco has lowered the death rate of men in Sweden to the lowest in Europe. Despite the health benefits of snus compared to Tobacco most of Europe has made the use of snus illegal. The Spectator takes a look at the Swedish phenomena in relation to the current debate on e-cigs and vaping. The bottom line for the Spectator on vaping is that Tobacco kills and Nicotine does not. The article has done well to strengthen their position on the health benefits of e-cigs with numerous facts and figures.